(Photo by Dan Gill) Autumn fern (Dryopteris erythrosora). Almost every landscape has shady areas, and ferns are a great group of plants that are just perfect for shady spots. Early spring is a great time to plant ferns into the landscape. It allows them to settle in and get established before the heat of summer. Most nurseries have an area covered with shade cloth where they display shade-loving plants for sale, and that is where you will find ferns. Ferns, in all their diversity, are among the most delightful and carefree of plants to use in shady garden beds. 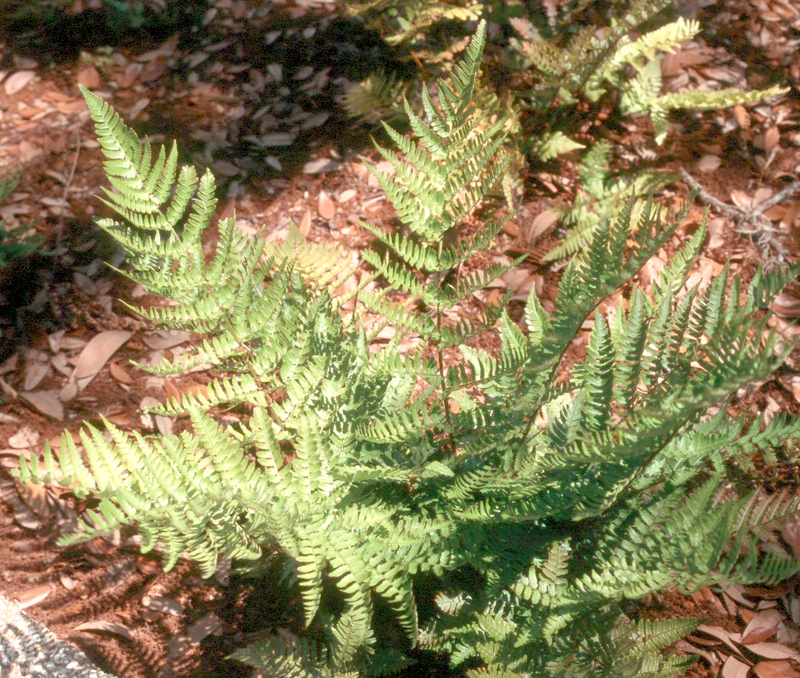 Many hardy ferns can be planted into the shady areas of your landscape now. The different species range in size from under 1 foot to as tall as 3 feet. The leaves of ferns are called fronds and provide the primary ornamental feature of the plants. Ferns that are commonly used in landscaping have fronds that are generally finely divided and delicate in appearance. The holly fern has an unusually coarse texture, and older plants can almost appear like small shrubs. Ferns do not produce colorful flowers. Their attributes are more subtle yet no less beautiful. It would be unfair to say that ferns are just green; they come in many shades from chartreuse to deep olive, and some produce fronds that are tinted with red or silvery variegations. Ferns often possess a grace of form and movement in breezes that is unique among garden plants except, perhaps, for ornamental grasses. Some of the ferns we can plant in the landscape are evergreen and some are deciduous. Deciduous ferns, such as the wood fern and royal fern, lose their fronds in winter and go dormant. Some of the evergreen ferns may suffer frond damage during sever cold spells, but often they retain their foliage throughout the winter season. If they are frozen back, they reliably return from their roots. One of my favorite things about ferns is that they are so easy to grow. Not prone to any major insect or disease problems, they are one of those plants you can just about plant and ignore once they are established. Ferns will grow best in areas that receive one to four hours of direct sun or dappled light during the day. Morning sun is greatly preferred. Definitely avoid hot, dry areas that receive several hours of direct sun in the afternoon, or areas that receive sun all day. If you want a fern-like plant for sunnier areas, you may plant yarrow (Achillea millefolium) or asparagus fern (Asparagus densiflorus Sprengeri, a flowering plant not related to ferns). The majority of ferns do best in a consistently moist soil. They do well in Louisiana because of our high rainfall and humidity. Of course, during dry periods we need to water landscape ferns. As with all plants, they have no timetable or schedule that you should follow for watering. Watering is done when the plants need the moisture based on the amount of rainfall that has occurred and how hot the weather is. Mulching a fern planting with your favorite material is highly recommended to conserve soil moisture and reduce weeds. When preparing a planting site for ferns, remove any weeds and thoroughly turn the soil. Spread a 2- to 3-inch layer of organic matter – a compost or rotted manure – over the area, and then dig it in making sure it is well blended with the soil in the bed. Shady areas often occur under trees, and it is entirely permissible to create planted areas under trees by incorporating ferns and other shade-loving herbaceous perennials, ground covers and shrubs. Respect and minimize damage to the root system of the tree, however. Avoid adding more than 2 or 3 inches of fill to the area, and do not sever any roots over an inch in diameter. When turning the soil, use a turning fork because it will be less damaging to roots than the blade of a shovel or spade. As time goes by, many ferns will grow into a fairly large clump. Should you need to divide your ferns, the best time is in late winter or early spring. It’s getting a little late now, but if you act promptly, it should still be OK. Ideally, ferns should be divided before the new, spring fronds have made much growth. Keep them well watered while they get reestablished. A few of the excellent ferns for use in the landscape include maidenhair fern (Adiantum capillus-vernis), holly fern (Cyrtomium falcatum), leatherleaf fern (Rumohra adiantiformis), sword fern (Nephrolepis cordifolia), Christmas fern (Polystichum acrostichoides), royal fern (Osmunda regalis), autumn fern (Dryopteris erythrosora), lady fern (Athyrium filix-femina) and wood fern (Thelypteris kunthii). You’ll probably see other attractive selections at your local nursery. Feel free to mix your ferns with other shade-loving plants. I especially like the fine-textured ferns combined with plants that have large leaves and a coarse texture for contrast. Some of my favorite plants to combine with ferns include all the gingers, ground orchid (Bletilla striata), cast iron plant (Aspidistra elatior), hostas, fatsia and aucuba. To add some color, use caladiums, impatiens, torenia and wax begonias.